Dr. Rudolph is a board-certified physician in medical oncology and hematology. Dr. Rudolph is actively involved in teaching and training medical students and is a Clinical Associate Professor at Augusta University. She has also written multiple educational articles and is actively involved in giving talks about the latest breakthroughs in treatment of blood disorders and cancer. She is a member of the American Society of Clinical Oncology, American Society of Hematology, and Medical Association of Georgia. Her special interests include breast, lung, colon, prostate, gynecologic malignancies, and lymphoma. 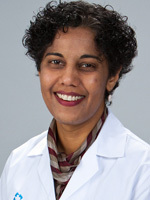 Georgia Cancer Specialists Dr. Priya Rudolph discusses National Prostate Cancer Awareness month. Dr. Priya Rudolph discusses: Can you prevent cancer with a vaccine?